If you manufacture, market or convert nonwoven disposable products, or provide nonwovens substrates to this segment, then we invite you to join us. Since 2008, INDA and EDANA have published Guidelines along with a labeling Code of Practice to help companies assess their product prior to making a flushable claim. We also promote one consistent “Do Not Flush” symbol to be used on products that do not meet the Guidelines or have a significant potential to be flushed, even if not designed or marketed for this purpose. 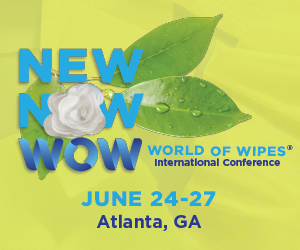 If you haven’t already, we encourage you to join with other leaders in the nonwovens industry and adopt the Guidelines and labeling Code of Practice. By doing so, you can have confidence in your flushable claim, correctly label those products that should not be flushed, and do the right thing for our environment and waterways. We suggest you begin with Edition Four of the Guidelines and the labeling Code of Practice.